Guests of Pacific Pearl will relish their time in the wonderful leather furniture and incredible 180 degree views. 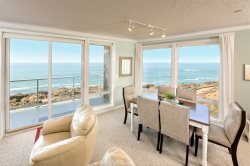 This unit features additional north facing windows looking towards Cascade Head in the spectacular great room. Couples and families alike will feel pampered while spending time in the private hot tub on the deck watching kites and seagulls flying in the sky. Never miss a beat with the 42" Plasma-Flat Screen TV and comfortable leather reclining chairs that enhance your comfort while you watch the beach, fireplace, and TV. The beautiful kitchen with granite counters and stainless steel appliances provide the perfect place to cook a quick snack or gourmet meal. Pacific Pearl is truly what the name says... an incredible gem that is the perfect accommodation for the ideal vacation at the beach. We love the location, cleanliness, and ease of having a condo for our family. Love being able to sit in the hot tub at night and watch the waves roll in.